The Brivido has two large gull-wing doors which allow access to both the front and rear seats. 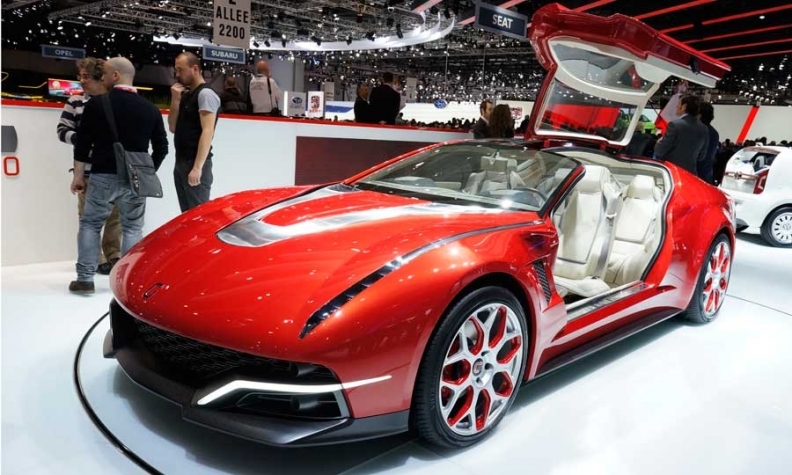 The four-seat supercar concept, which was unveiled at the Geneva auto show, has been designed to prioritize accessibility and interior space, Giugiaro said. The Brivido has two large gull-wing doors which are almost 1700 mm (67 inches) long. The doors give access to both the front and rear seats. These allow easy entry to the vehicle, which is just 1300 mm (51 inches) high. Instead of wing mirrors, the Brivido uses two monitors on each side of the sterring wheel to display images from side and rear mounted cameras. The concept is based a Volkswagen Group platform and is powered by a 3.0-liter V6 gasoline engine and an electric motor. It is capable of reaching 100 km/h (62mph) in 5.8 seconds and has a maximum speed of 275 km/h (171 mph).